Today I am posting the list of finished objects from last year. It is a motley list; there are some unattractive objects here, but some nice ones too. 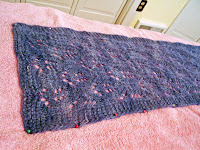 So in the interest of using this blog as a knitting journal, I want a complete record of the little I accomplish year by year starting with 2007. My plan is to link from this list to the original post about the object. If there is no previous post, I will add some notes here. Then I will create a link in the right hand margin to this post. I tried to do all of this by creating a page in Google pages, thus saving regular posting space, but I did not like the layout. 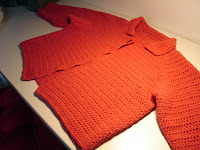 On Thursday I will have something better: a free pattern for the sweater called Bandersnatch. February: Improvised Scarf After the great scarf production of 2006 (15?) I started the year with another scarf. 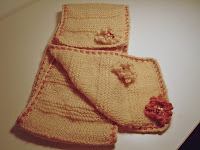 This was improvised with vintage yarn for a class with Judith Swartz on crocheted edgings. 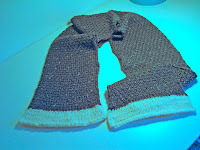 The scarf was lovely, but the edging was too tight and the scarf is not too useable. I also made some crocheted flowers. This was a simple sweater using some navy blue yarn I ordered online for a cardigan. It was too fine and soft for the use I intended. This sweater was not a success. The neckline was so wide it had to be sewn closer, and the seams, meant to face out, had to be sewn in because they were sloppy. This is one of two designs I have ever knit from IK, and it doesn't count because it's frogged. The blue jacket that I made with vintage yarn was such a success that I made it again with the yarn specified in the pattern. 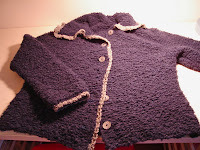 I used navy Relax yarn (boucle) and medium grey trim in a smooth yarn, Paton's Classic Wool. 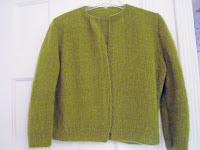 July: Mason from Rowan Vintage Style, named Pruning Sweater by me. 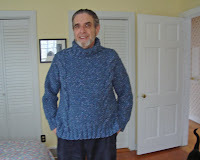 Men's pattern made for self in size small with specified yarn; modeled here by Roger. To keep up my crochet skills, I made this. Never mind. 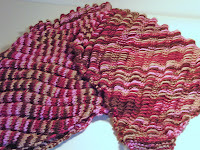 Crocheted fabric is thick and stiff. Crochet certainly has its place, but not in a sweater. Looks better in the picture than in real life. Frogged. My first sweater design. I am very proud. Stay tuned for many more details including a free pattern, coming later this week. 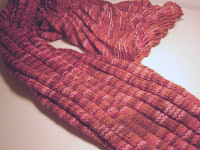 August: Suzanne's Scarf from Interweave Knits, Spring 2000, named A scarf of your very own by IK. The final installment of the great Christmas scarf project of 2006. It took me a year to finish this because it was such a slow knit. Sue is wearing it this winter (07/08) for the first time and gets compliments. A great success. I wear this frequently and continue to get compliments on it. The colorway, called Regency, is soft yet colorful and looks better in person. This came in handy on a plane trip to China that I took in mid-September. Patons Classic Wool Merino (100% merino wool); worsted weight; 675 yards; # 8 needle September: Kimono Shawl Neckwarmer based on Kimono Shawl from Folk Shawls. Love this sweater. 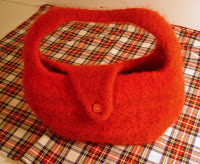 I read a blogger saying that it feels like a hug when you wear it. That is exactly right. And I now know why they call this yarn Crack Silk Haze. Second Clap made for Mother's Christmas present. And I'd do it again. This colorway, Rosewood, is very striking and photographs better than the first Clap. Very wonderful. 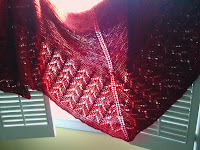 My first real shawl, not counting Clapotis. Blocked a little smaller than given in pattern: 31.5" x 70". 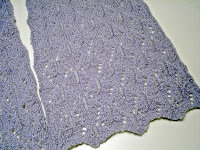 The yarn I used was recommended by the designer as a substitute for the discontinued yarn origanily specified. 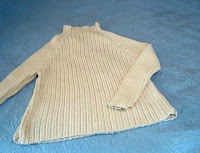 This sweater was inspired by a store bought cotton sweater. The pattern still need some tweaking (it's the armscye and sleeve cap, surprise, surprise) and the yarn choice needs revision, so I will have to reknit it. The yarn I picked is too soft; it needs a crisper feel. I'll post the pattern as soon as it's ready. As is, the sweater is flattering and comfortable to wear. This is an adorable pattern and it is available online through Interweave Knits, so I will have to take back what I said previously about not liking their designs. They do seem to excel in accesories, and I will probably be making more of them in 2008. I will stand by what I said about their sweater designs. This was a Christmas present that was well received and has been used by my daughter. I made it with yarn scraps, worsted weight, doubled. Brown Sheep Lamb's Pride and Berroco Ultra Alpaca; worsted weight; about 500 yards on # 13 needle. I can't believe I left this out in the original post. I have had to go back and add it. It was a last minute Christmas gift idea, but it turned out well. Although I haven't felt knitting burn out, in looking back over last year, I can see that I had it at the beginning of the year. It was probably all the Christmas scarves I made. I needed a break. But as the year progressed, the quality and amount of my knitting progressed as well. With two original sweater designs, five additional sweaters (not all good), and three shawls counting Claps, it wasn't a bad year. Bandersnatch looks like my kind of sweater. I'm eager to see more details. I would say you had a very good year. You had both product and process success. Thanks for sharing.